From left to right, 1. Dr. Mahesh Kumar Singh (Chief Research and Innovation Advisor, Ministry of Agriculture, Hungary) 2. Mr. Subhash Motwani (Founder – Namaste Tourism) 3. H.E. Dr. Norbert Revai-Bere (Consul General of Hungary) and 4. H.E. Dr. Laszlo Szabo (Deputy Minister of the Ministry of Foreign Affairs and Trade, Hungary), respectively, during the October 2015 visit of the Trade Delegation from Hungary to India. October 23rd commemorates the start of the Revolution of 1956, when the Hungarians rose up against the Soviet ruled communist regime. It also commemorates the ‘Day of the Republic’ as in 1989, after the fall of communism, Hungary was declared a Republic. In 2014, Hungary established its first Consulate office in Mumbai and this would be the first celebration of the National Day in Mumbai after the commencement of the Mumbai office. Hungary has taken giant strides in both tourism and trade and recently the Deputy Minister of the Ministry of Foreign Affairs and Trade – Hungary, H.E. 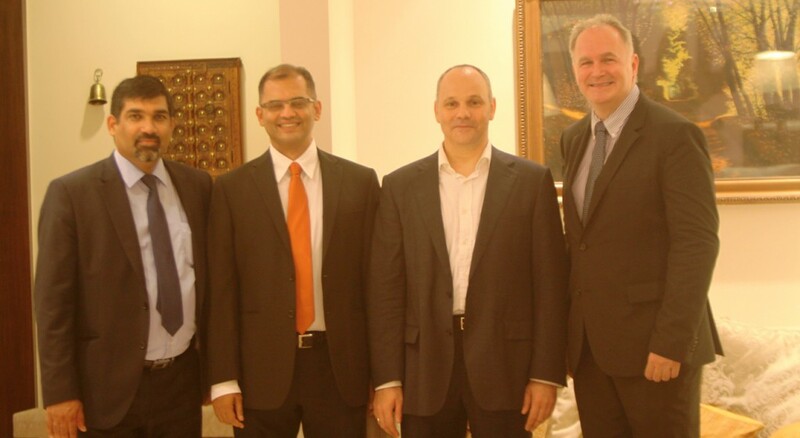 Dr. Laszlo Szabo was in India to forge alliances and exchange in trade between India and Hungary. Last year, H.E. Dr. Norbert Revai-Bere started the Consulate of Hungary office in Mumbai and within a few months of opening the Consulate, Dr. Bere also took the onus of creating awareness of tourism to Hungary along with H.E. Szilveszter Bus, Former Ambassador of Hungary to India and currently the Deputy Secretary of State and together launched a website in collaboration with Mr. SubhashMotwani, Founder of Namaste Tourism. In this way, the first and only dedicated website for the Indian outbound Traveller to Hungary was initiated. The Namaste Hungary website offers holiday ideas to the discerning outbound traveller seeking unique experiences that Hungary has to offer. The Consulate General of Hungary in Mumbai in collaboration with Namaste Tourism is glad to present this 16 page “Namaste Hungary” special print edition to further bring the Indo-Hungarian relations closer, for years to come.